The Black Geode is crawling with elemental evil, and the party pushes their limited resources to the limits as they make their way deeper into the crystal caverns. Initially I thought the PCs would retreat and attempt to Long Rest somewhere. For two sessions they’ve had enough XP to reach level 10 – you’d think that would be a major priority! But hats off to the party for opting instead to dive deeper into the elemental earth dungeon. 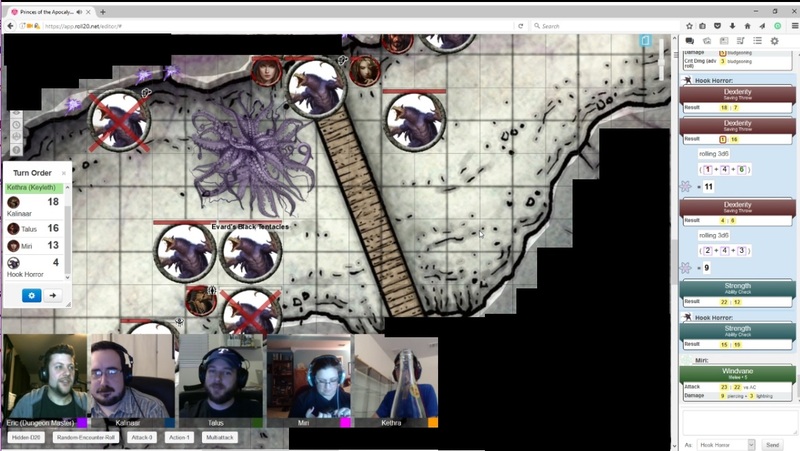 Beyond the initial cavern they found a stonemelder cultist with a xorn, a gnarly 3-legged creature with a giant mouth on top of its body. Instead of these enemies just waiting to attack someone, they’re engaged in an odd ritual. The cultist is feeding gems and coins to the xorn, believing it to be an emissary sent by Ogrémoch himself. The party saw this unfold and decided to test it out. I was pleased when both Kethra and Talus took the initiative. I love Kalinaar but when it comes to role-playing situations, he’s the kid in the class that’s always raising his hand and shouting “pick me!” Every RPG group needs that player. But I also try to involve everyone, and am delighted when others flex some RP muscles. Kethra used Mage Hand to bat away a gem, startling the group. Instead of attacking, however, the xorn wanted the players to feed it some of their immense wealth. The cultist translated its needs, and the party began to feed it. First in small gold increments, then with gems. 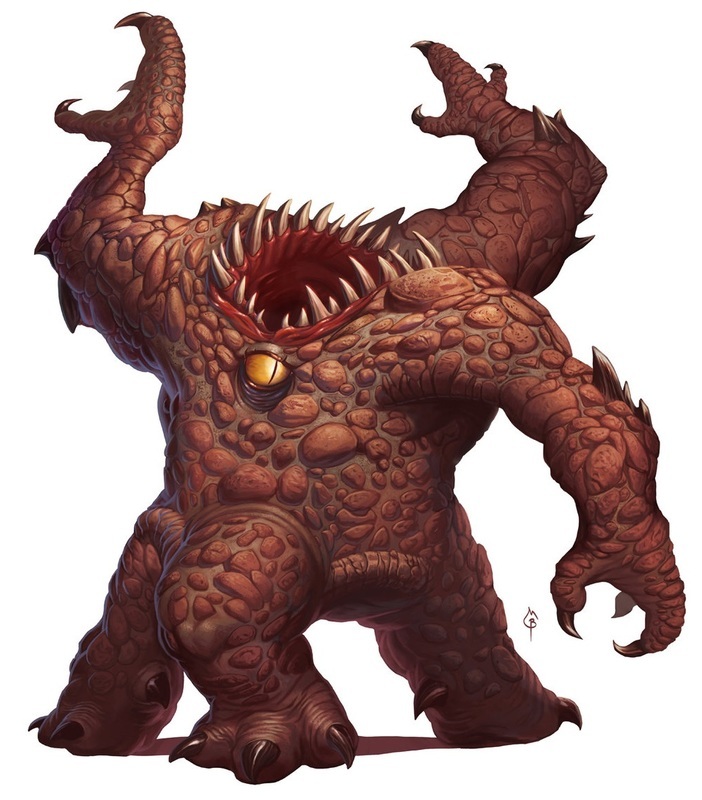 According to the campaign book the xorn needs a substantial amount of money and/or gems before it’s satiated – far more than any adventuring party would feel comfortable giving up for a peaceful solution. So I lowered that threshold drastically while telling the party that it remains docile while being fed. They got the message and began moving through the chamber. Kalinaar interrogated the cultist, who was friendly but reverential toward the xorn, while Kethra stealthily stole his bag of gems (to then feed to the creature). As a greedy rogue, Kethra was hilariously horrified by the loss of treasure. Eventually the xorn backed off, and the party used the opportunity to leave the chamber. The cultist told them to head East, but was cryptic as to why. The party took the advice, finding the treasure pile in G3. Now any adventurer worth their salt should know that a pile of treasure lying out in the open is an obvious trap. Hell in this adventure alone it’s been used several times already. Sure enough, they dove after the treasure, and one of the stalactites opened an eye to reveal a roper! Another spiffy monster, the roper has giant tendrils that lash out and pull its victims toward its gaping mouth. In the first round I was able to grab both Miri and Talus. I failed at actually biting anyone, however, while Kethra failed at hitting it with her crossbow. Meanwhile Kalinaar was busy digging through the treasure! Talus didn’t like this situation at all, so he fired off a Hypnotic Gaze on top of the creature, and used a divination die to force it to fail the saving throw. The creature was stunned, though still grasping its foes. What followed was a funny, awkward moment as Miri and Talus failed again and again to wriggle free of the tendril’s grasp while the creature lay dazed. After several rounds they finally made it, with Miri slow falling and Kalinaar catching Talus. With the treasure pile looted, the party opted to simply leave the area before the creature woke up. I later counted that as defeating it, since there’s no reason to return there. From there the party took a crazy zig-zag path, traveling straight west through a long tunnel to G4, the crystal forest. This area really could’ve used some sort of monster in it, as the Confusion effect isn’t all that dire when there’s nothing else around to threaten them. As it were only Kethra fell victim to it, and then rolled a 9 so nothing bad happened anyway. From here paths lay Northeast and Northwest. Northeast is a giant mud waterfall which Kalinaar wanted to dive into. The rest were not keen on that idea, so they traveled the other direction toward the giant chasm of G10. This was kind of a bummer, since this chasm seems like it works way better if the PCs fall in it from the bridge that spans across it 40 feet in the air. Instead they walked through the large chasm hearing the clicking and clacking of the hidden hook horrors. Miri ran up the wall to scout out the bridge, and I decided to launch the attack. Hook Horrors are only CR 3, but there eight of them in this chasm, proving a long, difficult fight for the PCs. Kethra was nearly killed, Talus got within half health, and even Kalinaar got dangerously low as he was surrounded. Talus unleashed Evard’s Black Tentacles on three of them, helping break up a dangerous situation. He then turned the tide at the end by Polymorphing Kethra into a T-Rex, giving her a fresh set of HP and easily destroying the last few Hook Horrors. Now the party is really in dire straits. They’ve pushed themselves and spent much of their HP and spells in that fight. They’re in the middle of a big, dangerous dungeon with no safety net in sight. The party has never really been in a situation like this before, but continue to impress me with their raw power. Do they press on to the node or retreat and heal up? We’ll see next week!